Finding a craft that I can do in an afternoon is a challenge. Luckily, Halloween has provided me with lots of neat ideas, many of which I have found in the pages of magazines! All You had this idea for a cute cat mini pumpkin candy jar, which I modified slightly for cost and time. Here is how to make one for your kids! 1) Paint the mini pumpkin black, except for the bottom. Allow to dry. 2) While it's drying, cut one kind of the small ribbon in a length sufficient for it to go around the mouth of the jar. Hot glue into place. 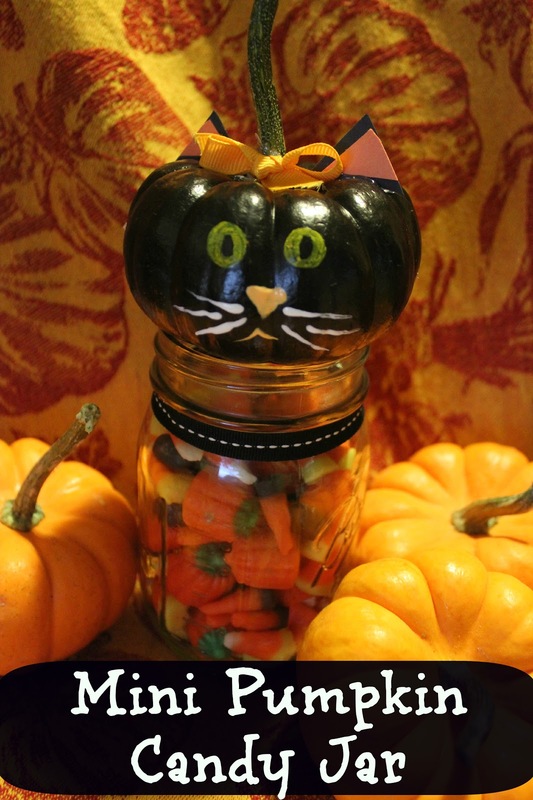 After the ribbon is glued, fill the jar with your choice of candy. 3) When the pumpkin is dry, paint the bottom portion black. 4) While the pumpkin is drying, make a small bow from the 2nd color of ribbon and hot glue it to the stem. 5) When dry, create two ears out of the corners of the black and orange construction paper. Glue them to the top of the pumpkin on both sides of the stem. 6) Now, it's time to paint the face. Using the yellow Sharpie paint pen, make two cat eyes. Using orange acrylic paint, make a small triangle nose (pointing down) and a mouth. Use a toothpick to draw on the whiskers with white paint. You're all set! Simply place the pumpkin head on the body of the jar. This is a cute way to store candy, and it took less than an hour start to finish!